Keeping things cool has always come naturally to Central Bernard Inc. as part of the job. 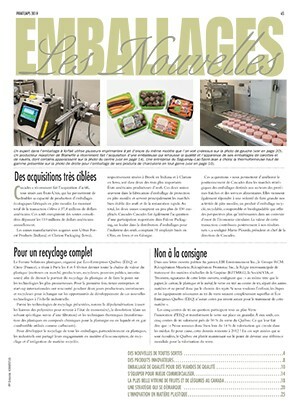 Located in the Lachine area of Montreal, the 50-year-old poultry processor offers a high-quality air-chilled fresh poultry line of products designed to cater to the needs of the most quality-demanding customers through its flagship Continental Grill retail brand, a no-name generic brand, and various value-added private label formats. Despite the company’s current success in providing superior quality fresh chicken cuts, it wasn’t quite the vision its founder Theodore Dedes had planned back in 1962. Filled with fresh chicken portions, foam trays manufactured by Casacades have shrinkwrap film applied to them by an Ossid 500E leak-resistant overwrapper (photo above) before moving to the end of the line, where an Ossid End Seal Shrink hot-air shrinkwrap tunnel (photo below) produces a neat, tightly-wrapped package at speeds of up to 60 packs per minute. After establishing a promising customer base, Central Bernard eventually began servicing restaurants and wholesale customers with poultry, beef, pork and other meats, before narrowing its focus to just poultry processing and packaging for the retail market. After four expansions and three moves, Central Bernard nowadays supplies poultry-based product to most major retail food chains in Ontario, Quebec and Atlantic Canada. “Even with the shift in meat product offered and growth of the business, Central Bernard has always maintained our father’s reputation by providing our customers with the highest-quality at the best possible price, and we have built on that with our uncompromising and personalized customer service,” notes Billy, who along with his brother and vice-president of operations, George, have literally grown up in the meat industry. Situated within a state-of-the-art 50,000-square-foot HACCP (Hazard Analysis and Critical Control Points)-certified facility since December of 2003, Central Bernard runs a one-shift, five-days-per-week schedule for 130 employees who help process some 150,000 kilograms of poultry each week in many varied tray-pack sizes. 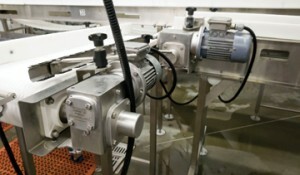 The temperature-controlled plant environment is ideally suited for the safe manipulation of poultry products, according to the Dedes brothers. “Our facility houses a full-time inspector from the CFIA (Canadian Food Inspection Agency) and meets or exceeds all food safety protocols and standards,” says Billy, adding that all third-party audits performed by main customers regularly confirm the impeccable quality of the plant’s environment. With food safety a key issue for the food processor, Central Bernard is also currently working towards a GFSI (Global Food Safety Initiative) certification for SQF (Safe Quality Food) approval. Because Central Bernard is a federally-approved poultry processing plant, all products coming in and going out are logged, monitored and tested. “We ensure that everything—from the initial visual product inspection, the measuring of bacteria counts and the growing of cultures, to the inspection of the outgoing product—is continually monitored,” states Billy. 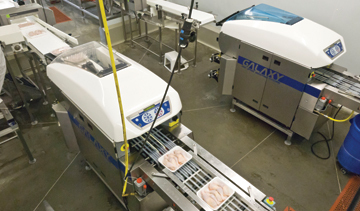 Workers place portions of chicken onto the Cascades-manufactured foam tray as the product moves towards Central Bernard’s four packaging lines. 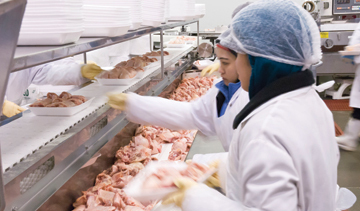 A few years after moving into its current digs, Central Bernard held discussions with Sobeys Inc., Canada’s second-largest food retailer, who was looking for a reliable supplier of fresh poultry packed in trays with a leak-resistant overwrap. George explains: “Sobeys wanted each individually-wrapped tray to have a label containing pertinent data such as the product weight, price, barcode, sell-by date and other information. But being a customer-driven company quickly took care of that shortcoming, Billy recalls. “It is always paramount to remain flexible to meet the individual and changing needs of all our clients,” he says, explaining a 2008 addition of a new packaging line within a completely refrigerated processing area. This new line consists of a station where fresh chicken parts are placed onto a conveyor, which moves them to a loading area where workers hand-place the meat onto foam trays. 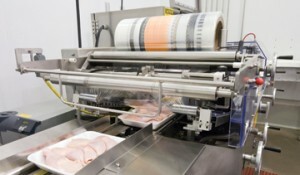 The loaded trays move through an Ossid 500E leak-resistant overwrapper for a film application and heatshrink sealing. An Ossid 1500 Series weigh-price labeler then applies a label to each tray pack before it is case-packed, palletized, and shipped to Central Bernard’s customers. According to George, Central Bernard’s workers had the system figured out within a week of operation, running the production at its top speed of 60 packs per minute. “It was fantastic,” exclaims George. “This new line was running at twice the speed of the other lines we had at our plant at that time—lines that were also sometimes prone to hardware and software issues. Multiple heavy-duty Nord Gear motors power the conveyor systems on Central Bernard’s four production lines. Because the new line and the business with Sobeys proved to be highly successful, further changes followed. “Up until that time, our chief business was private-label and generic poultry packaging in both fresh and frozen segments,” says operations director Danny Sedra. Sedra says that after looking at the facility’s floor space usage and the production line equipment, while evaluating where future growth might be expected to come from, Central Bernard opted to get out of the frozen-poultry business altogether to concentrate solely on the fresh product side. The plant’s two independent processing and deboning lines and four counter-ready fresh tray-pack lines are all linked with an elaborate full-automatic conveyor system. 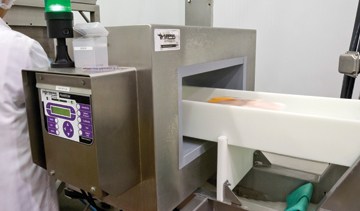 “Skinning machines start the process by rapidly removing the skin from the meat, allowing our team of 60 or more employees to begin the paring or deboning process within seconds,” relates Billy. A Fortress Technology Phantom metal detection quickly scans tray-packs of high-quality fresh chicken for contaminants and other foreign objects. 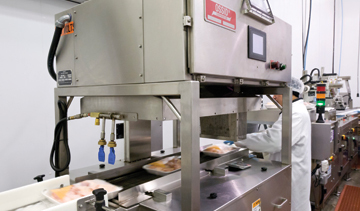 Set up to meet the specifications of Central Bernard’s customer’s needs, the boneless chicken products are then bulk or tray-packed accordingly using a MAP (modified-atmosphere packaging) system. After weighing and labeling, the product is casepacked, palletized and shipped out to the customer. “At Sobeys, the foam trays are taken directly from the shipping cases and placed onto the retail shelves,” says Billy. 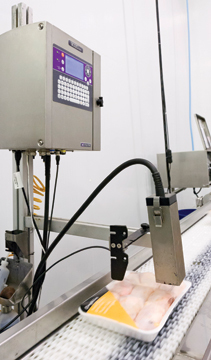 The four packaging lines—each running at 60 packs per minute—consist of two Ossid 500E and two Ulma Galaxy tray-packing machines that were all purchased within the past three years. 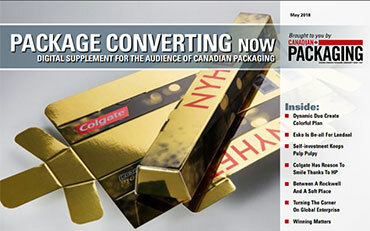 According to Ossid, a division of Pro Mach Inc., the leak-resistant 500E overwrapper helps the customer save money by using between 36 to 41 per cent less film than most standard overwrap packaging machines. The stainless-steel 500E uses a vacuum and stretching system of a positive package air removal to help create a perfectly stretched overwrap finish around the foam trays manufactured by Cascades Inc., to create tightly-wrapped, leak-resistant, end-sealed case ready packages. Able to store up to 50 different tray programs, the 500E enables operators to perform a changeover in less than two minutes, while servo-driven technology and microprocessors provide a notable reduction in downtime and maintenance. The Ulma Galaxy, manufactured by Ulma Packaging, LLC, an automatic stretch film wrapper designed for fresh product packaged in preformed trays, also gets top marks from the Dedes brothers. Central Bernard uses two Ulma Galaxy automatic stretch film wrappers supplied by Heat Sealing Packaging to achieve superior leak-resistant packaging for its fresh products. “Easy to use, easy to clean, and great-looking results. 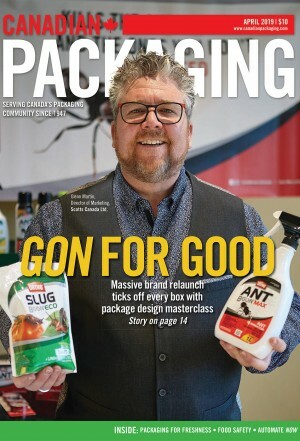 Our two Galaxy’s have been strong performers for us,” says Billy while also complimenting Cryovac, a division of Sealed Air, supplying film for the Ossid 500E machines and Linpac Ropak film for the Ulma Galaxy equipment. Along with the tray packing, the company still offers a high volume of bulk-bagging services to its customers, operating four M-Tek Inc. gas-flush machines, running with film bags supplied by Transco Plastic. 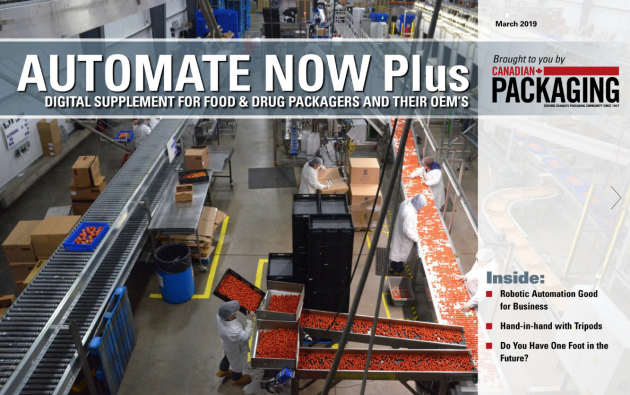 • Corrugated cartons supplied by Paramount Paper, Multi-Services GSTJ Inc. and Unibeauce Inc.
One of four 9030 IP65 small-character inkjet coders manufactured by Markem-Imaje applying best-before date and batch number data to all packs of chicken leaving the facility. “While we still do a lot of bulk format packaging, many of our retail customers have moved to a pre-packaged, counter-ready and/or value-added product,” says Billy, explaining a market trend driving the way Central Bernard does business today. Along with the company’s long-standing efforts to always provide an affordable, quality product, Central Bernard’s current processing plant is also a testament to its key desire to operate in a sustainable and environmentally-friendly manner by improving its processes to reduce energy consumption and carbon emissions. Other ‘green’ options for Central Bernard customers include include packaging used to reduce the environmental impact. “We also made a conscientious decision to move away from waxed corrugated cartons to a fully-recyclable wax substitute carton to better serve our customers,” says Billy. 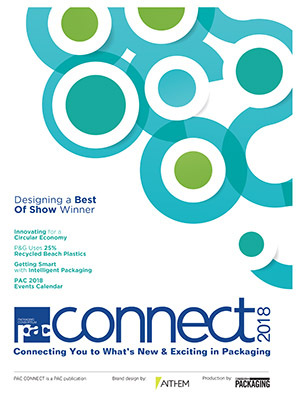 “It’s also why we are continually on the lookout for the best packaging equipment technologies on the market to provide the best solutions to meet customer needs,” sums up Billy. “Even far into the future, our goal will always be as it has been from Day One: to build long-term customer relations based on our ability to process and supply the highest quality, value-added poultry products to our customers in a cost-efficient manner, while always exceeding customer expectations in terms of quality, food safety and service.